The Cumberland & Dumfriesshire Farmers Mart P.L.C. 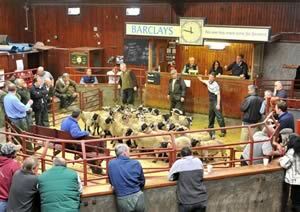 had forward 32 prime cattle, 27 over thirty month cattle, 6,552 prime lambs and 6,228 cast ewes & rams at their weekly sale at Longtown on Thursday 21st October, 2010. Prime cattle met a much sharper trade with more numbers required to fill orders. Top price 182.5p for a Limousin heifer from Messrs Blaylock, Hallburn and purchased by W Kirkup & Sons, Butchers, Longtown. Others to 179.5p, 172.5p Wyseby Hill Cottage, 168.5p Brydekirk Mains, 167.5p Hallburn. Charolais 167.5p Hallburn, 163.5p Sceughdyke; Angus 160.5p Sceughdyke. Top price per head £1032.13 for Limousin from Wyseby Hill Cottage, and £1030.05 for Charolais from Sceughdyke. Bullocks to 154.5p for Limousin from Messrs Watson, Low Lonning, & R Byers & Son, Woodslee, who sold others to 152.5p, 151.5p Newby Farm. Top price per head £1127.85 for Limousin from Woodslee. OTMs sold at recent rates with top price to 113.5p for Angus heifer from W J Corrie & Son, Shank Castle. Limousin cows 103.5p Highburnfoot, 97.5p Cherry Garth, 83.5p Hilltop; Friesian 85.5p Scugg House; British Blue 92.5p Blindhillbush; Angus 87.5p Albierigg, 86.5p Kilnhill. A massive show of prime lambs were forward to the usual ring of buyers with trade easier on the week due to more numbers and export problems in France. The sale averaged 151p.Top was £130 for a Charolais tup lamb from Coytre. Suffolks to £81.80, £76.20 Sceughdyke, £75.80 Farnbury, £75.20 Upper Mains; Cheviot £78 Bloch, £63.80 Cleongart & High Floweryhirst; Texels £91, £80.50, £80, £79.20 Waltonwoodhead; Rouge £83.50 Bogside; Halfbred £66.20 Adderston Shiels, £63.80 Earlside, £62.80 Adderston Shiels; Greyface £75.20 Greensburn, £69.50 Far Howe, £68.20 Nunscleugh; Cheviot Mules £62.80 Granton, £59.80 Philiphaugh; Blackface £75.50 Roachburn, £66.80, £63.20 Castlemilk, £63 Milnmark; North Country Cheviot £67.80, £65.80 Whiteknowe, £56.80 Sorbietrees; Swaledale £57.80 Burnhouse, £50 Deadwater; Jacob £56.50 Hilltop; Leicester £60 Midtodhills; Llynn £73.20, £65.80 Whiteclose, £63.80 Thorneylands; Oxford £56.80 Hollybush; Easycare £59.80 East Fortissat, £55.80 Cleongart. Lightweight lambs to £59.20 for Texels from Craig, Ronachan & Coytre; Suffolks £57.80 Broadhaugh; Cheviot £54.20 Unthankhope, £49.80 Bankhead; Greyface £57.80 Arnicle, £56.50 Pry Hill; Blackface £52.50 Brantwood, £50.20 East Fortissat; Swaledale £43.80 Bateyshield; Beltex £57.80 Bogside. Another excellent show of ewes forward to the usual ring of buyers. Heavy ewes similar on the week, but with a large percentage being hill ewes, the smaller ewes were £2-£3 easier. The sale topped at £158.50 for Leicester ram from Sheepriggs, £148.50 Gall, £138.50 Mosshead, £128.50 Sheepriggs. Cheviot £98.50 Gall, £76.50 Stackbraes; Texel £128.50 Tirrill House, £112.50 Sherra Craig; Charollais £78.50 Cara View; Blackface £78.50 Crowhall, £68.50 Pitland Hills & Hott; North Country Cheviot £118.50 Philiphaugh, £104.50 Brantwood, £96.50 Brackside; Swaledale £86.50 Maryside; Llynn £78.50 Mossfennan; Zwartbles £68.50 Ruthers. Heavy ewes to £118.50 for Texels from Philiphaugh, £113.50, £112.50 Westmillhills, £110.50 Brantwood & Randalholme; Suffolks £100.50 Philiphaugh, £96.50 Mossroad; Charollais £90.50 Alton; Halfbred £94.50 3 Skaill, £84.50 Easthouse; Greyface £92.50 Daltonfoot, £86.50, £84.50 Trough Head; Cheviot Mule £82.50 Crawthat, £78.50 Barnglies; Leicester £110.50 Mosshead, £88.50 Sheepriggs; North Country Cheviot £92.50 Tirril House, £90.50 Philiphaugh, £88.50 Gospel Hall; Beltex £86.50 Newton; Milk sheep £63.50 Langwathby Hall. Hill ewes to £78.50 for Cheviots from Crawthat, £70 Sherra Craig, £68.50 Crawthat; Blackface £68.50 Kellah, £59.50 Eastfield & Gall; Swaledale £54.50 Midtodhills, £51.50 Nunscleugh, £49.50 Brantwood; Herdwicks £47.50 Brantwood; Lonk £66.50 Stackbraes.